TOKYO and IRVINE, Calif., April 15, 2019 — (PRNewswire) — Alteryx, Inc. (NYSE: AYX), revolutionizing business through data science and analytics, today announced its new office opening in Tokyo. The new office will support the success of hundreds of current customers in the country, including Honda and Toyo Engineering, and growing demand for its end-to-end analytics and data science platform in the broader APAC market. This office opening is indicative of the company's 96 percent year-over-year (YoY) growth in international markets for the full year 2018, which accounted for 29 percent of overall revenue as of Dec. 31, 2018. "By introducing Alteryx, we have improved efficiencies in our new income stream and with developing citizen data scientists," said Yoshiaki Sugimoto, business development supervisory unit, Honda. "The Alteryx Platform also helps us obtain valuable knowledge and insights from driving data, now accessible to our community for an improved driving experience. We're excited to have regional representation from Alteryx to support us in developing deeper expertise and increased agility in our data analytics initiatives." HD or high definition maps, are fast gaining traction on account of the increasing awareness about the sophisticated technology which helps to provide accurate navigation and higher dependence on the internet. In fact, HD mapping is an essential part of the autonomous cars that have flooded our roads these days. Its demand is also being driven by the popularity of app-based online cab aggregators such as Ola and Uber. This is because HD maps provide detailed information about road traffic, road shape, lane slope, curvature, roll data and elevation. The HD Map market is expected to reach CAGR of +19% during forecast period 2019-2025. The report, titled Global HD Map market defines and briefs readers about its products, applications, and specifications. The research lists key companies operating in the global market and also highlights the key changing trends adopted by the companies to maintain their dominance. By using SWOT analysis and Porter’s five force analysis tools, the strengths, weaknesses, opportunities, and threats of key companies are all mentioned in the report. SAN FRANCISCO — (BUSINESS WIRE) — April 15, 2019 — This week, the NG-11 mission will launch from the NASA Wallops Flight Facility carrying the Cygnus cargo spacecraft. This spacecraft will deliver supplies to the International Space Station (ISS) and transport 60 small satellites, called ThinSats, into space. 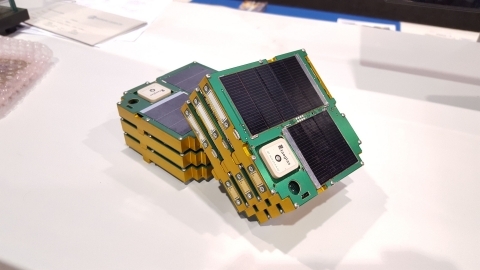 These satellites are powered by Alta Devices gallium arsenide solar cells and will carry various electromagnetic, radiation and inertial sensors for scientific analysis of the atmosphere. SUNNYVALE, Calif., April 15, 2019 — (PRNewswire) — Trimble (NASDAQ: TRMB) announced today that registration is now open for its 2019 in.sight user conference + expo for transportation, which will be held September 15-18, 2019, at the George R. Brown Convention Center in Houston, Texas. The theme for this year's in.sight is the "Power of Together" and the three-day event will be filled with industry speakers, educational sessions and networking opportunities, all demonstrating how Trimble and its customers, working together, can make transportation safer and more efficient. "Our customers represent many of the brightest and most innovative minds in the industry. in.sight gives us the opportunity to come together and share ideas on how to use technology to improve transportation," said Thomas Fansler, general manager of Trimble's Transportation Division. "We look forward to returning to Houston this year and continuing to make in.sight an unparalleled educational and networking event for every attendee." The UAS traffic management (UTM) system market is in its developmental phase. Since 2014, NASA, along with UAS community partners, industry leaders, various governments, and academic researchers, are actively developing and testing the unmanned traffic management research platform. Many successful tests and demonstrations for communication prototypes, beyond visual line of sight (BVLOS) operations, mission planning, and longer range application prove that a commercialized market for unmanned traffic management is gradually emerging.Moreover, the need for UTM services has also resulted in the development of regulatory framework for the deployment drones around the world. This regulatory framework is expected to include operational limits, key responsibilities of the stakeholders, aircraft requirements, etc.Governments and regulatory authorities have made some exemptions in 2018 with regard to the operation of commercial UAVs, which has been a driving factor in the UAV market growth. April 16, 2019 -- International aquatic remote sensing company EOMAP will showcase its unique contribution to the world-first 3D habitat map of the Great Barrier Reef (GBR) at the International Forum on Satellite-Derived Bathymetry, SDB Day 2019, next month in Australia. The mapping project, ‘3D live habitats for the full extent of the Great Barrier Reef’, will provide, for the first time, maps of the predicted coral types and underwater landscape for the more than 3,000 reefs within the 350,000 km2of the GBR. EOMAP's cutting edge technology provides essential data for this revolutionary project, in which the University of Queensland (UQ), Great Barrier Reef Marine Park Authority, and the Australian Institute of Marine Science are partners. Lokeren, Belgium, April 8th, 2019 -- Orbit GT releases a new version of its SaaS solution 3DMapping.cloud introducing 3D Models support and Hybrid Resources. In the image: a 3D Model of a traffic light positioned in 3D and visualized in a point cloud view and a spherical image view. Data © City of San Sebastian, Spain. Another great new feature is Hybrid Resources. These resources are declared in 3D Mapping Cloud to be used as any other resource, however the data is stored in a different environment, e.g. Orbit GT’s 3DM Publisher (for on premise installations). Hybrid Resources allow users to blend publicly available content with their own private content, even when not physically stored in the cloud. Carrières-sur-Seine, France, April 15th 2019 - SBG Systems will present for the first time at AUVSI’s Xponential show in Chicago (U.S.), the Quanta UAV Series, a brand new line of Inertial Navigation Systems (INS) dedicated to UAV-based Surveying Integrators. Because SBG Systems wants UAV surveyors to save autonomy for additional survey lines, the company has designed a small, lightweight, and low-power inertial navigation system offered on two levels of accuracy. Quanta UAV and Quanta UAV Extra have been developed for compact LiDAR to high end BVLOS mapping solutions. They provide precise orientation and centimeter level position data delivered both in real-time and post-processing. This direct geo-referencing solution eliminates the need of ground control points and greatly reduces the need of overlapping.